Grill On The Market was a bar and grill just south of Smithfield Market, previously known as Smithfield Bar & Grill. It closed down in late 2018 due to insolvency problems in its parent group Blackhouse. 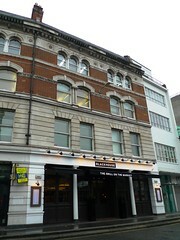 A bar and grill just south of Smithfield Market, previously known as Smithfield Bar & Grill. The restaurant area is at the back. Toilets are downstairs, in the basement. bob, elvum, billy, Steve and Phil visited on a Thursday evening in January 2009. The bar and restaurant were full when we turned up at 8:30pm. Thankfully we had booked a table, so we could take advantage of the January 50% off sale on food. When we visited, there was a musician playing live, which contributed to a very noisy atmosphere. Since it is also a bar there is quite an extensive cocktail list. Billy had a Manhattan (£6.95) which he described as almost as good as the ones he makes himself. Steve had a 750ml bottle of Duvel (£10.50) — one of only two or so non-lagers — which he found to be quite good. We also had a decent enough bottle of Malbec for £18. They brought us two jugs of iced tap water when asked. bob had some really good calamari (£6) to start. The flesh was cooked was just right, and the batter was light. Tentacles are always fun. Phil and Steve had the chicken satay (£6), quite a large piece of chicken with quite a decent spicy peanut sauce, although a little dry for Steve's taste. Billy had beef carpaccio (£7.50), while elvum had a warm mushroom salad (£6) with shredded bacon and bread which was really excellent. For his main bob had an 11oz fillet steak rare with chips (£25) and peppercorn sauce as an extra (£1.75). The steak was really good, charred on the outside and red and warmed through on the inside. The chips were fine. The peppercorn sauce actually tasted strongly of peppercorns. Elvum didn't seem too impressed with his 10oz sirloin (£18.50), which was slightly overcooked and a little bland. The accompanying horseradish mash was excellent though. He also had a small avocado side-salad (£5.50). Phil had a chateaubriand (£39) to himself. It looked somewhat small but the bone had been removed, and Phil seemed happy with it. Phil also had some roasted beetroot (£3), which was good. Billy had a lamb steak (£15.95). bob was happy enough with his apple crumble (£9.90). Steve had sticky toffee pudding (£5.75) which came with ice cream and was very good without being overly sweet. Elvum had melba mess (£5.50), while Billy had lemon sorbet (£3.50). bob's verdict: It was really good at 50% off. It would have been fine at full price too, even with the considerable background noise. elvum's verdict: It was good value with the 50% food discount, although little things like the facts that bread was an expensive extra and that the 12.5% service charge was calculated on the undiscounted bill left me with the impression that the proprietors had a passion for profit more than they had a passion for food. Last visited by bob, elvum, billy, Steve and Phil, January 2009. Prices verified at that visit (and shown above before the discount was calculated). Last edited 2019-02-01 15:40:40 (version 12; diff). List all versions. Page last edited 2019-02-01 15:40:40 (version 12).